Role of the line management in the future - is there one? Line management has a long history and quite often a special place in organizations. Line manager position have been something people are going after. Things have been changing, role of line management has been fading and even in some case going away. Still all organizations have some kind of line management. There's someone in every organization who is the boss. Role of the line management in the future organizations is a difficult question. In one hand line management has it's role of bringing comfort and safety for the people, but then on the other hand it can slow down work, create competing priorities and even demotivate people. Especially difficult it is when line management has ties with operational responsibilities and company size grows over one team doing it all mentality. In the past line management have had lot of operational responsibilities. Line manager used to be responsible that his or her people did their jobs properly. Also line managers did have content and operational responsibilities. They had to make sure right things were done and also in the right ways. That still seems quite natural, it's quite hard to guide if they can't also affect on the work their people are doing. Then line managers started to get more and more responsibilities of the soft side of people. How people are doing? How they are developing themselves? And what worries they have? At that time there started to come more operational and content related guidance from other sources and line management didn't have that much to say about the content their people were working with. Nowadays line management in many occasions have become almost totally HR function. Line managers arrange the one to one discussions with people, focusing on personal development and in some companies also to set targets. Do we really need line management in the future organizations? What if we wouldn't have line management at all. No one couldn't tell people what to do and people would need to figure out themselves. I bet this would work in many cases. There are even examples of self guiding organizations, where people just make things happen. No guidance needed. This sounds like an optimal approach. No one would have boss whom they would need to report to and no one would ever come to say what to do. Even though it feels like an utopia I believe organizations could work without any line management. From content point of view I don't believe people need to be told what to do, they can figure things out themselves. So is there anything line management is still needed then? I can see two important points. First people need safety. People need to have someone they can count on in case there is something they can't figure out themselves. Things like this can be about company functions as pay or healthcare or then about how people behave. Once in a while there are misconducts and then it is important that there is line manager to help. Second important point is personal development. It's rare that people would be that good on analyzing their own competences and the improvement needs that they wouldn't benefit from having a good teacher or coach to help them. This is what line management has a proper place in organizations. Line managers can help with competencies and guide and push people to develop their competence to right direction. They can also work as enablers to get training, coaching and peer learning from other people. Both of these activities, safety and competence development doesn't actually need people to be bosses. The people responsible for these in organizations do need to have certain authority to do these jobs well, but they don't need to be supervisors in the old sense. I believe role of line management can actually be a service in the future. Many aspect of line management already are handled as a service, but maybe all of it could be. So do people really need just one supervisor to help them. Why they couldn't have a small group of them working as a service guiding and helping people on in all the necessary ways. Somehow I feel this change wouldn't actually be that big to the ways many companies are already working. The change would be mainly mental. Line manager wouldn't mean your boss anymore, it would almost mean that you would be the boss and line manager would be the servant. I try to read couple of sports books every year. 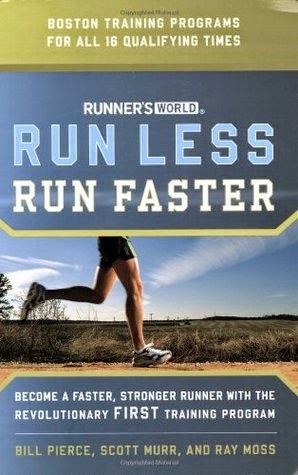 I've heard from couple of different sources that Run Less Run Faster is an excellent book for busy runners wanting to develop their run. Idea in Run Less Run Faster is easy, concentrate on your key runs and make sure you stay healthy. Book advises to get rid of junk miles, meaning the runs without specific purpose. Also it explains that three runs in a week is enough when it's supported with proper supporting training. I do agree with the thinking in the book. I've run maximum of three runs in past years and I've been able to run much faster than previously. I've also discovered that key to improvement is different kind of runs and pushing yourself to the limits. So I do think book is good and valuable for many people. Book also gives quite good exercises for runs and strength training. It is a good source for knowing what speeds to use in different exercises and what should be the amount of rest in different intervals. Also for strength and flexibility training it explains the basics. What I worry with this kind of guidance to training is that it kills the joy of training. When every exercise have specific meaning and you need to watch you clock all the time, you easily lose the joy you can get from exercises. Everyone, including myself, should once in a while remember why they are training, for themselves or for some other reason. The book in itself is easy and enjoyable. Especially for the runners who don't do enough different kind of exercises, this is a must read. For the people who already have wide range of training in their program, this might not be be worth of reading.